Dubai, UAE, April 07, 2019: As part of the cooperation agreement between Dubai Sports Council and the French Football Federation (FFF), a team of experts from the FFF were in Dubai to evaluate football academies at Dubai clubs. 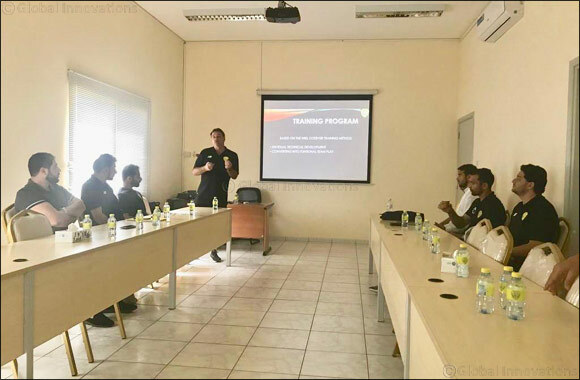 The FFF team evaluated the academies’ training modules, technical programs and medical units, starting with Al Nasr club on April 1 and then travelling to Hatta club and Al Shabab Al Ahli Dubai before finishing at Al Wasl on April 7. “This program is one of the most important programs organised by Dubai Sports Council under our cooperation deal with the French Federation,” said Ali Omar, Director of Sports Development at Dubai Sports Council. “The FFF is one of the best international associations in the field of nurturing talent from academies and the junior level, and giving them opportunities to develop into quality players. “If you see the team that won the 2018 World Cup, most of the players were graduates from French club academies. Additionally, the French Federation boasts some of the top technical experts in the game. “So through this program, the Council seeks to benefit from the experience of the French Federation and use it in Dubai clubs as part of our efforts to develop the football academies sector and to develop mechanisms for its technical evaluation, selection and development of talented young. A number of development programs have been organised under the cooperation agreement between Dubai Sports Council and the French Football Federation (FFF), including a workshop for trainers from Dubai’s football clubs and academies, which attracted more than 120 participants.